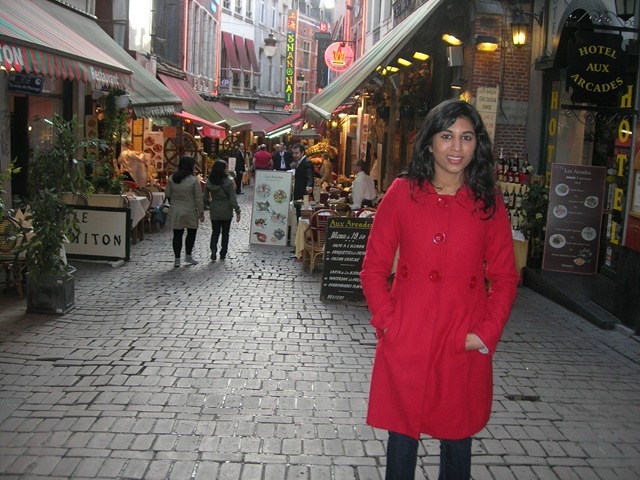 Strolling down the Rue Des Bouchees in Brussels, Belgium for the second time I am certain that I am not going to be tempted by that well-groomed, eloquent, and charming waiter behind me. He will showcase gorgeous seafood displays, and try to lure invite me into his restaurant, but I will hold strong passing by him and the other waiters I encounter on my way to the infamous Chez Vincent. Without faltering I make it to the landmark eatery and do a double take, as the entrance leads you through their kitchen first in order to get to the dining room. Although we did not have reservations, the staff were very polite as they quickly found us a table and seated us promptly. I look around the room and observe that many of the diners were older business men who most typically are good eaters and always enjoy a beer or two, a tell tale sign that the restaurant was a great pick. 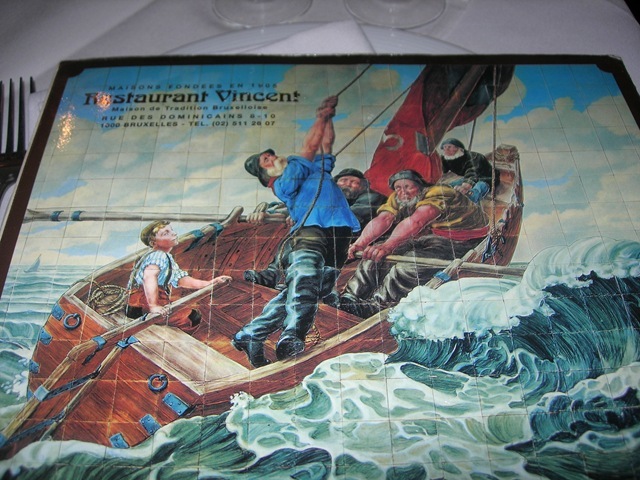 The menu was a reflection of Belgium’s coastal geography showcasing seafood at its finest. 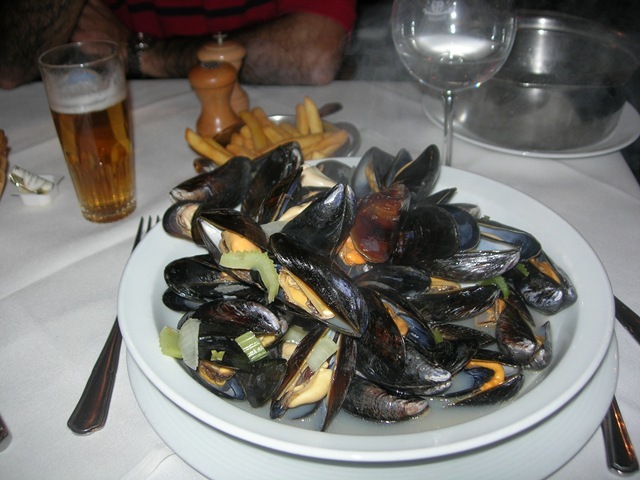 Of course one of my priority Belgian eats was Moules Frites. This dish consisting of mussels steamed in a fragrant broth and served with a side of fries is a staple of the country’s cuisine and is revered by food enthusiasts all over. I order the mussels steamed in white wine. The steaming bowl that was brought to me was heaped with these molluscs beaming with coral mussels peeping out from under their onyx shells. They were tender and succulent and came with a silver bin for chucking the shells. The broth itself was salty from the liqueur released from the mussels and had a mild seafood flavour that was accentuated with aromatics in the form of celery and onion. The fries were in a category all their own. They were thickly cut, and golden and once you started going it was really hard to put them down. These batons of potato were fantastically complimented with a gravy boat of home made mayonnaise. The mayo was silky and had that mustardy vinegary twang that one could never get out of a Hellman’s jar. Trust me, I’ve tried. It was a fantastic meal that I will never forget, and as the image on the menu alluded to, I could taste the freshness in every bite. 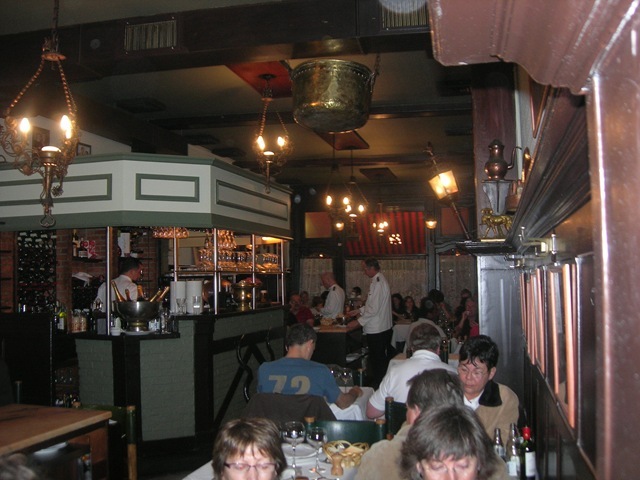 This restaurant is located just off the Rue Des Bouchees on the Rue des Dominicains. 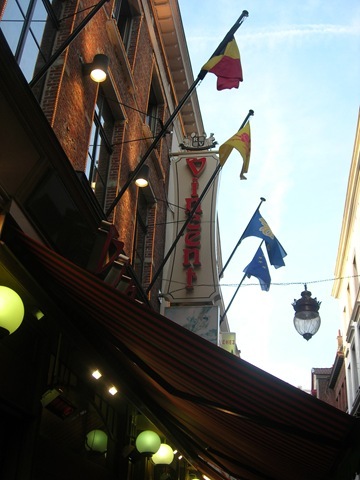 Alongside Aux Armes de Bruxelles, this is a must eat the next time you’re in Brussels. Have you tried La Paloma in Woodbridge, ON? They have a huge offering of very “flavourful” flavours of gelato and ices and soy based products (for “lactose free” people). I’ve been there, although it was quite some time ago. Must visit to refresh my memory! I remember that their ferrero rocher was quite good.